Many of the pictures of the early quilts were scanned from very small pre-digital photographs, so forgive the poor quality of a few of the pictures in the first gallery. Sorry. For most (but not all) of the quilts in these galleries, you should find a full view followed by a detail shot (what's a quilt without a good look at the stitching, right?). 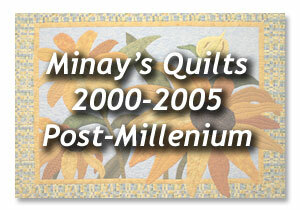 My husband, Michael, recently created a large (17" x 11") 2011 calendar from pictures of a dozen of my quilts. It's available at CafePress if you would like to have a look. It would make (hint, hint) cool Christmas gifts for some of your quilting friends -- or for you. These were the very first quilts I did. Some were based on existing patterns, but I also started creating my own designs at this point. I experimented with a stencil technique called theorem painting, and several of the examples in this gallery reflect that. I continued experimenting, trying to create some things that were unique, but still sticking to the feel I had for the traditional. I started experimenting with three-dimensional quilts about this time too. Most of the quilts in this section are original designs, but a few (like Cowboy Dan) were taken from patterns. Many of the quilts in this section were the result of scrap trades at a quilt guild I belonged to during this time period. I still have several dozen unquilted tops left from the block trades that I hope to finish someday. 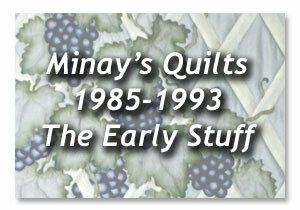 A few photographs from a One-Woman Show I had at Great Expectations Quilt Shop (Minay Sirois: A Legend in Her Own Sewing Room -- Quilts 1990-1997, A Psychatric Perspective. Ha! Humor! This five-year period was very productive for me. 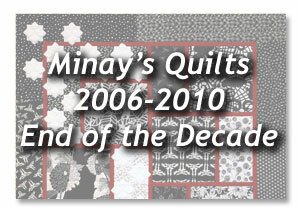 I finally felt like I was beginning to hit my stride as a quilter. I'm still experimenting, though, so there's a wide range of styles. Almost everything from this period is original. This isn't everything. 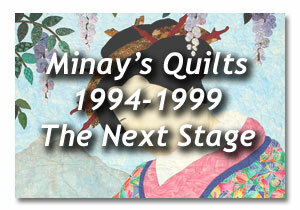 A few pictures are missing, so we may update these galleries periodically, and there are still over a hundred unquilted tops for me to work on, plus new quilts to design, so I'm sure new galleries for 2011, 2012, etc., will appear at some point. There's still a wide mixture here, partly because I'm now finishing some of the quilt tops I assembled eight to ten years ago, and because I'm creating new quilts, some of which were designed with the idea of marketing them as patterns.